Seabrook Police Officer Derrick Christensen was recognized for his noble efforts in apprehending a felon who attempted to flee from the 337th District Court in downtown Houston, when the Seabrook City Council and Seabrook Chief of Police Sean Wright presented him with a Certificate of Merit at the July 7 council meeting. On Thursday, May 21, 2015 Christensen was subpoenaed to be a witness for a DWI case at the Harris County District Attorney’s Office in the 337th District Court. As he arrived, a sentencing hearing was taking place for a convicted felon. When the judge announced the defendant’s prison term, the defendant proceeded to flee from the courtroom. Christensen, without hesitation, apprehended the defendant and while the defendant physically resisted arrest, the Seabrook officer was able to gain control of the situation and prevented him from fleeing. Christensen’s actions not only prevented the defendant from escaping, they also prevented the courthouse from being locked down. 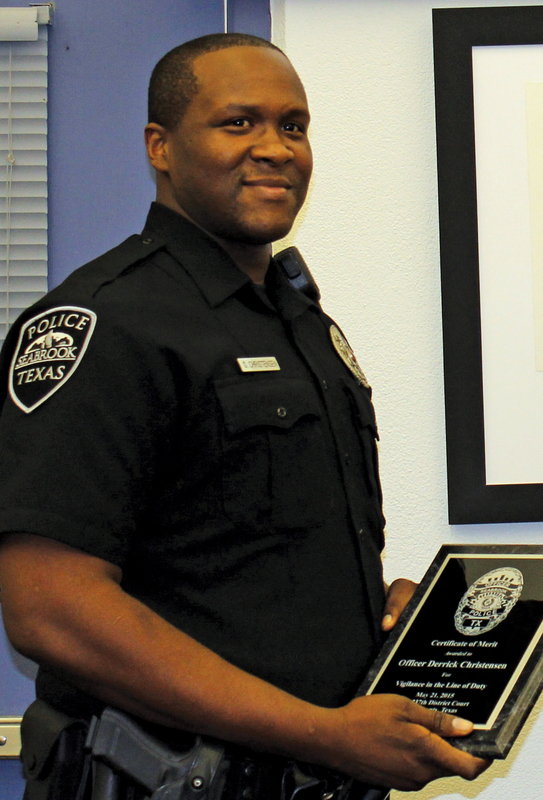 Christensen began working with the Seabrook Police Department in September 2014.